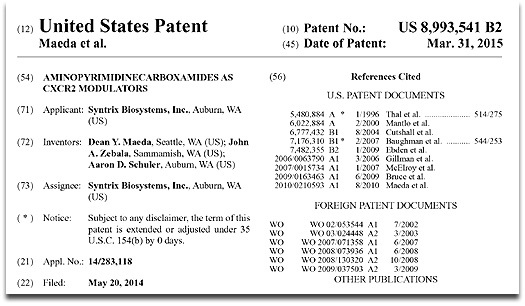 Congratulations to Syntrix scientists on their latest issued patent at the United States Patent and Trademark Office. Inventors: Maeda, Dean Y. (Seattle, WA); Zebala, John A. (Sammamish, WA); and Schuler, Aaron D. (Auburn, WA). Abstract: There are disclosed aminopyrimidinecarboxamide compounds useful as pharmaceutical agents, synthesis processes, and pharmaceutical compositions which include aminopyrimidinecarboxamides compounds. More specifically, there is disclosed a genus of CXCR2 inhibitor compounds that are useful for treating a variety of inflammatory and neoplastic disorders.